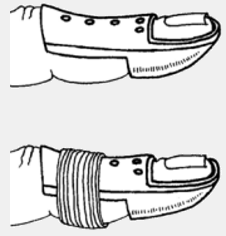 When the splint was first put on the physiotherapist or nurse will have applied some white tape that helps to keep your finger straight while you have the splint off to clean your finger and dry it. Information provided by the Canterbury DHB. Adapted by the West Coast DHB. Last reviewed May 2017.